Construct. This is a classification of the main entities or activities I spent my time on. Priority. The relative importance I gave to each construct. Note that 1 and not 5 – I wish! – is the highest priority. Time. In hours. The total of 168 hours is the number of hours in a week. Percent. The ratio of the hours spent on a construct in relation to the weekly total. Comment. An explanation of the activities within a construct. The details of the spreadsheet contained more than what is shown. For each construct, it included (a) what you get, (b) what you give, (c) the dominant feeling, and (d) whether change was possible. For example, the entries for Family were respectively: Love, Subsistence, Love and Impossible. For God: Meaning, Devotion, Reverence and Must! 1. Might add constructs of community and country. 2. If Sleep takes 33% and Work another 33%, only a third can be devoted to the others. 3. Work represents a full 49% – make that 50% – of waking hours if you include ablutions and meals. 4. The time spent on the higher priority constructs are incredibly the lowest! This is the base model that comprises what we call the “Hierarchy of Man’s Loyalties”. That’s a mouthful so I will shorten it to the “Hierarchy of Loyalties”. Since August, I have involuntarily thought about the importance of the model in explaining the behavior of man in terms of his relationships with himself and the other constructs. Why involuntarily? Well, the universe creates birds that have no recourse but to sing (or, if you wish, Forms arise from and fall back into the ocean of the Unmanifest). In a psychological and even philosophical sense, the model may be as useful as Maslow’s “Hierarchy of Needs” in understanding that most rampant of earthly species called Homo Sapiens. If you will, all the actions of our days arise from Maslow’s needs but they are driven in intensity by feelings of loyalty, whether that loyalty is to an idea or to an entity. It may be said that the loyalty we display is the measure of our need. 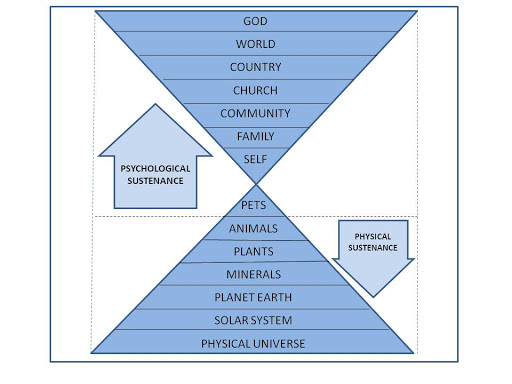 The base model is what I refer to as the Psychological Sustenance Hierarchy (PSSH – pronounced “shoo”, with a silent P, like the sound to drive away wayward children and animals). It is a “base” model because, unlike Maslow’s, the Hierarchy is dynamic and not static as we shall see. Basically the Hierarchy is comprised of real and ideational artifacts created by men to sustain his psychological and spiritual being. The artifacts are bounded by man-made rules – naturellement – and are composed of men with the exception of the God construct, although some men are wont to think they are Him. The ideational constructs have actual representations in the physical world and – who knows? – perhaps even in the spiritual world. I am developing a paper that attempts to explain the model as a whole as well as to describe each element and their interrelationships. What has caught my attention is that the model may be a useful tool to view, if not to resolve, questions of ethics. This notion has been with me for some time, but its significance grew on me as I tried to understand my reaction to the controversy over Carlos Celdran. But before we go into that, let me make some observations about the base model. I will not fully explain all the observations I make. These will be in the paper, so I will just give examples, to some but not to all, as we go along. Just enough to give you an idea of where I am going. One, the PSSH can be seen as concentric circles, with the Self as the innermost ring and God as the outermost ring. Except for the Self, each ring is a parent that encompasses child rings. Thus Family encompasses Self, and Community encompasses Family and Self. Two, the model is dynamic. It is Expandable, Collapsible and Substitutable. Expandable. A man may have more constructs than the base model. He may belong to a social club like the Rotary Club, and this construct would normally be positioned between Family and Community. He may also have a mistress, and she, too, would be positioned (no pun intended) between Family and Community. Collapsible. A man may have less constructs than the base model. He may be an orphan and not have a family and moreover – poor soul! – he may not belong to a church. Substitutable. Within a construct, a man may direct his loyalty to a substitute or replacement. A man may change his country and the ex-mistress (God forbid!) may replace the wife. Integrity refers to the quality of oneness or wholeness. A man is himself and no other. A country may be an island, an archipelago or a continent. Identity refers to the name of a construct. A man may be called Jose; a church St Mary’s Cathedral or Mormonism; a nation Japan. Viability refers to the ability to grow and develop normally. A baby has biological viability. A church with plausible doctrines has institutional viability. A nation with resources has economic viability. Substantiality refers to the nature of a construct. Some constructs are natural, that is occurring in nature, and others are unnatural or artificial. The first three constructs – Self, Family and Community – may be said to be natural. I have included Community because fish and birds do organize themselves into communities. The middle two constructs – Church and Country – are artificial and man-made. The last two constructs – World and God – are ideational and the last is super-natural. By World we refer less to the planet Earth and more to the different major classifications of mankind: East and West; First, Second and Third Worlds; the Two Kinds of People; and the Good, the Bad and the Ugly (kidding!). Growth is an extension of Viability and refers to the ability to extend in the dimension of space. A man physically grows from a baby to an adult, and a country in terms of additional territory, or even infrastructure and economic development. Persistency is another extension of viability and refers to the ability to extend in the dimension of time. A man also grows in age from a baby to an old man. A man has a short persistency compared to that of a country. A country may have a shorter persistency than a church. Porousness refers to the quality whereby the composition of a parent construct is fluid with respect to its child constructs. The composition of a community, church or country may increase by addition, with members being born or moving in; or may decrease by deletion, with members moving out or dying. Four, the interaction of the constructs in terms of loyalty can be characterized by Direction, Intensity and Reciprocity. Generally, the Direction of the feeling of loyalty is by choice, but while volitional it may also be circumstantial. A man’s loyalty to a church may be strong and true but his particular attachment may arise as an accident of birth. Five, there is a “natural” Direction, or a bias of loyalty, which is reflected in the sequence of the list. The natural bias seems to be that the Intensity of a man’s loyalty is directly proportional to the proximity of the object construct. 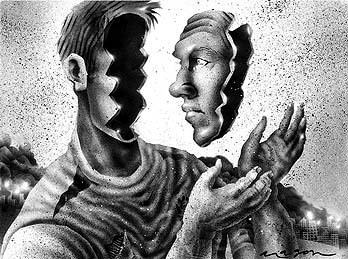 What construct is closest to Self? Why, his own self! Thus a man’s highest loyalty is to himself, followed closely by that to his family. I call this the Natural Upward Bias (NUB), in contrast to the Natural Downward Bias (NDB) of the Physical Hierarchy. The NUB starts at Self and ends at God. The progression is from something physically real to something ethereally nebulous. Moreover, the progression is also from selfullness (or selfishness) to selflessness. And six, I cannot resist pointing out a neat symmetry: the first construct, God, corresponds to the last construct in the Physical Hierarchy, the Physical Universe. Should we eat Ben, our pet pig? How do we humanely treat animals that we use for food? Are we taking enough care of our planet to sustain future generations? What is the protocol for visiting extraterrestrials? In Part 2, we will discuss how the Hierarchy provides a new way of looking at the world. Erratum: "Porousness" is missing from the last bullet point under item "Three". "Porousness refers to the quality whereby the composition of a parent construct is fluid with respect to its child constructs. "The following explanation of Porousness should also be added:"The composition of a community, church or country may increase by addition, with members being born or moving in; or may decrease by deletion, with members moving out or dying." Thos damn Chinese hackers at work again. I've made the changes in the original text. I have this sneaking suspicion Edgar is descended from, or a reincarnation of the ancient Greek philosophers. Conjuring up something like this in BC years would have immortalized him along with Aristotle and Plato.I cant wait for the succeding parts. This is important in forming a world view. Oh Joe, you may want to hop on to Catholic apologist Dicky Boncan's site, A Struggling Dad. There's a lively discussion there on his latest post on Team Buhay/Patay. I posted a comment there. Also on Fr Tabora's site. Will do, Andrew, thanks. I note that "Dad" posted a comment on your article this morning, too. 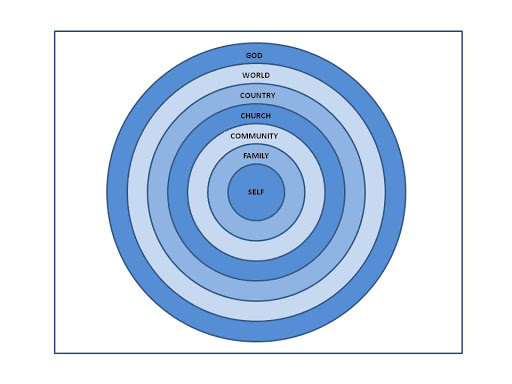 The Heirarchy of Loyalties: God, World, Country, Church, Community, Family, Self is presented in the model as a series of concentric rings, and in the second diagram as a pyramid. I am most interested in the cross-cultural comparisons, American with Filipino. There is no "typical man" in either land, because we all walk as individuals, but perhaps there is an "average man".I'd see the shape of the concentric circles to vary by culture. The self is huge in both, but perhaps inflated just a little more in the Philippine circles.God, Church and Family are larger in the Filipino model.World and Country are larger in the American model.Community is perhaps just a smidge larger in the Philippine community.So the Philippines has generally more robust loyalties, yet the binding quality of harmony seems larger in the American model.How strange. Maybe the loyalties are so loyal that they are inflexible, and that leads to strife.I suppose that gets us to the attributes of "direction, intensity and reciprocity" and within them, the action of vegeance. Re 5. Edgar has successfully rejigged our minds. Even the literate joesphivo and cha have taken to counting. Well I remain committed to chaos and disorder now and then, as it is easier to defend. Thanks, Andrew.I have more than a sneaking suspicion that I am – a dreamer. But I am not, as the song goes, the only one. And the world will be – many-in-one. Cha,1. It is Wednesday and not Monday. If it had been Monday, I would not expect a response at all. Joe is spacing out Parts 2 and 3 so there should be enough time to let everything sink in.2. You are correct, loyalties are fluid. I call it Substitutable. The Direction and Intensity of loyalties are volitional. As I say, the Direction may be conscious or it may be circumstantial or accidental. It may be chemistry. Why do we love someone in particular and not another? If I knew that, you may address me as Your Holiness. :-)3. No. 1 is any overarching world view (Weltanschauung). Some non-believers substitute Evolution for God. Others might accept Nihilism.3.1 In the Psychological Hierarchy, World is more notional. Originally, I conceived it at as the Brotherhood of Men. The physical world, the planet Earth, is in the Physical Hierarchy – that is it provides physical nourishment to man.4. OMG! You ate Porky? But he's practically a member of the construct Family! :-)5. 😉 We will allow Joe his transgressions. There is a certain beauty in Chaos. It is the Unmanifest. I have to admit, forgive my soul, I AM NOT LOYAL TO ANY COUNTRY. I go to America because it offers me better pay, chance of success based on my character and knowledge not by the color of my skin and looks. Here is the order of importance to me:1. My son. He is always top and foremost on my mind2. My wife. Of course, what makes her happy makes my son happy. What makes my son happy makes me happy. Everybody in the household is happy. (My wife has come to conclusion that she cannot convince me to believe in what she believes in. My son do not go to church anymore. My son has plenty of excuses not going to church short of telling his mother that there is no God. Despite me not believe in God, she realized that I am a goot atheist because I keep money coming compared to those Filipino faithfuls. Between religion and money, MONEY WON!!!)3. I wanted to involve myself in the barrio. Problem is when they need food on the table they come to me. We are not food bank. Their chldren sick they come to me, am not even a Doctor. Religious wife angry. Not give. Neighbors angry my wife not give. Wife put fence on the property, neighbor angry because they lost their shortcut to the jeepney stop. We ask neighbor to keep it down, they are angry. We ask permission to run sewer thru the side of their property, they don't allow us. I angry. We left. We are now living in gated enclave. Peace of mind. No more barrio. Gated community is more sedate, thoughtful and forgiving. 4. End of priority.No more neighbors. No more barrio. No more !!! I am tired. My focus is my family and precious U.S. passport if things really go awry we'll take the first plane out before Philippines ignite. Has anyone wondered why Filipinos envy and jealous of HAPPY FAMILY? I am still scratching my head why I envy and become jealous when I see very poor families drinking happily away their food money. While I worry so much money for the rainy days that kept me dancing on sunny days.I also envy and jealous of these poor people who totally depend on God for their daily sustenance, whereas, I depend on ourselves for surviving.Could they be right and I am wrong? And I thought I was happy …. 1. Oh, you’re jumping from the General to the Particular. Variations on a theme.2. I agree that the size of the circles would vary by culture. You are right in relating these to the attributes of Direction, Intensity and Reciprocity. It makes sense that if these vary at the individual level, it should also vary at the cultural level.2.1 Perhaps the answer for the differences between cultures lies in the chronological and psychological age of the culture. The Philippines is much younger as a nation. Filipinos are less individuated than Americans; they are less independent, so they would lean on external resources and constructs that are nearer to the Self – in particular Family and Church – that would give them psychological security.2.2 Filipinos are at the third level of “Love/belonging” of Maslow’s Hierarchy – that of friendship, family and sexual intimacy. Americans are at the fourth level of “Esteem” – that of self-esteem, confidence, achievement, respect of others and respect by others. (2.3 Dare I say and dare I claim that we as individuals are at the top level of “self-actualization”?)3. There is an interconnection between Maslow’s and the “Loresian” models. If I may paraphrase a statement in the essay: Our actions arise from Maslow’s needs but they are driven in direction and intensity by feelings of loyalty. Kindly instruct Edgar on the notion of "love". He is struggling with that one, and it is the one barrier between him and holiness. He grasps chaos all too clearly. Your Reverence, you are good, very good. Yes, chronology, with about a 50 year span but narrowing quickly as the US progresses in reverse. It is interesting, Mariano's perspective that the concept of "nation" is weak or non-existent within him. I'd guess that diminuation (is that a legitimate word?) comes with being an OFW, or being an American taking up residency in the Philippines, where my current national passions reside. The American ones aren't gone or even dormant, they are just resting. 1. Mariano, you are a riot.2. The hierarchy of your priorities is perfect. Family and Self, and a little of the gated community. Never mind the rest!2.1 My wife attends Church for me.3. There is no mystery to the mystery of poor men who drink away their food money. The only construct they are concerned with is the Self. That and the satisfaction of the Self is their one and only priority.3.1 Are they right? And are we wrong? Even without waiting for Part 3 of this essay, if your happiness lies in your son and wife, then you have answered your question. The lack of identification with a nation is not ruinous. From a larger perspective, it may be advantageous. To be a citizen of the world is better than to be narrowly jingoistic. But, yes, there might be something sad about a man without a country. There are colorful celebrations associated with constructs above Self, celebrations of fellowship. Filipinos with their fiestas, food, dancing, karaoke – wait, scratch that last one. "if things really go awry"What are you referring to? If Philippines attack China …If China attacks Philippines … If Filipinos breaches the moat-and-drawbridge enclaves of the rich … … If Filipino Muslims turn against their government for allowing the Malaysians to rout them … See, these people always go after with the least resistance, The Philippine Government. The Filipino people has already bent backward to accomodate them and they do not accomodate us. Is that right or do I have them backwards? heh The Chinese may have invaded my brain. Backwards. Should be the other way around. Thanks. Je peux vous dire quе ce n’est pas inexact !